ASUS starts shipping the ROG STRIX Scope, a new gaming keyboard with tweaks for FPS gamers. The peripheral has 2x broader CTRL buttons and uses Cherry MX RGB (Red, Brown, Blue or Black) mechanical switches. Other special features include a one-touch Stealth key, switchable media controls, and AURA RGB LED illumination. Pricing is unknown. 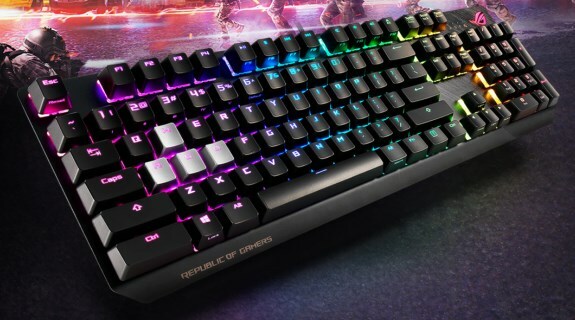 ASUS Republic of Gamers (ROG) today announced ROG Strix Scope, the mechanical gaming keyboard with Xccurate Design – an extra-wide Ctrl key for enhanced precision on FPS battlefields. An aluminum faceplate lends Strix Scope everyday resilience and is finished with a striking slash aesthetic for a little touch of style. The keyboard also includes Armoury II, enhanced driver-based software that offers more extensive controls while using less system resources. An intuitive UI makes it easy for gamers to tune Strix Scope to suit the game or gameplay style – enabling them to create profiles, customize colors and lighting effects, map keys, record macros and more. It’s even possible to track hardware stats during gameplay for data analysis. The outstanding design and innovation that went into the creation of Strix Scope has already been recognized and awarded, with the product winning the prestigious 2019 iF Product Design Award in the Computer Accessory category. The iF Product Design Awards spans multiple disciplines and attracts many thousands of entries from dozens of nations every year – so Strix Scope fought off strong international competition to secure its victory. No modern gaming keyboard is complete without eye-catching lighting, so Strix Scope features per-key ASUS Aura RGB LEDs, plus an illuminated ROG logo. Compatibility with the Aura Sync ecosystem makes it easy for gamers to harmonize Strix Scope’s light shows with other Aura Sync-enabled components, both from ASUS and partner manufacturers. Avid ROG followers may have noted that Strix Scope was previously revealed as Strix CTRL during CES® 2019. This product-development codename was subsequently changed and finalized as Strix Scope to clearly express a key battlefield benefit of the extended Xccurate Design Ctrl key.